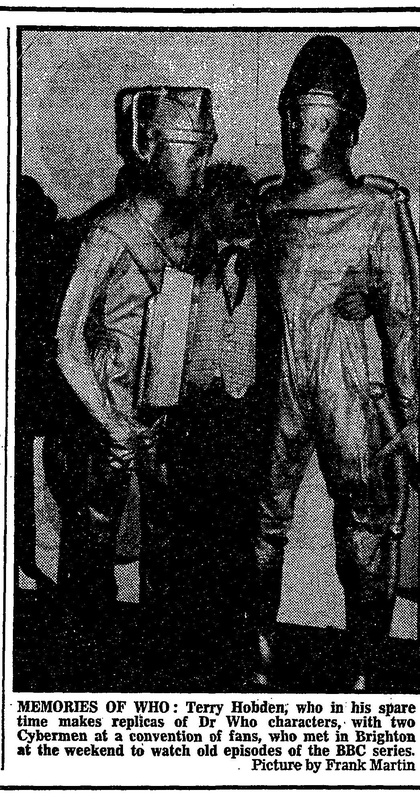 Terry Hobden; who in his spare time makes replicas of Dr Who characters, with two Cybermen at a convention of fans, who met in Brighton at the weekend to watch old episodes of the BBC series. APA 6th ed. : (1985-07-29). Memories of Who. The Guardian p. 4. MLA 7th ed. : "Memories of Who." The Guardian [add city] 1985-07-29, 4. Print. Turabian: "Memories of Who." The Guardian, 1985-07-29, section, 4 edition. This page was last modified on 2 January 2015, at 23:46.